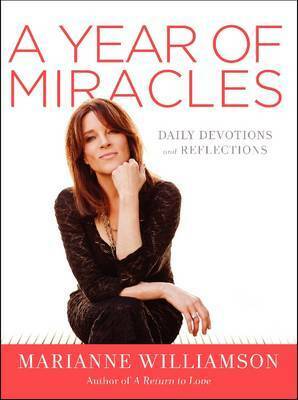 In A Year of Miracles, Marianne Williamson, the #1 New York Times bestselling author of the classic A Return to Love and world-renowned teacher, offers a daily devotional that helps us develop a positive, loving mindset and encourages us to live our best selves to bring miracles into our lives. Williamson has taught millions around the world the simple yet profound lesson that has helped them tap into the divine within themselves and lead a happier, more fulfilled existence: How we think determines how we live. If you change your thoughts, you can change your reality. If you strive to put your best self forward, the universe responds, actively helping you, creating miracles that allow you to flourish. A Year of Miracles is her collection of 365 spiritual readings, including prayers, meditations, declarations, and affirmations-one for each day of the year-that offer guidance, support, and enlightenment to focus your thinking. With this thoughtful meditative devotional, you can stay mindful, hopeful, and centered every day, producing miracles in your life. Combining wisdom drawn from her bestselling books as well as fresh insight, A Year of Miracles helps enhance your spiritual journey and opens your eyes to see God acting through the universe to provide all that you need.